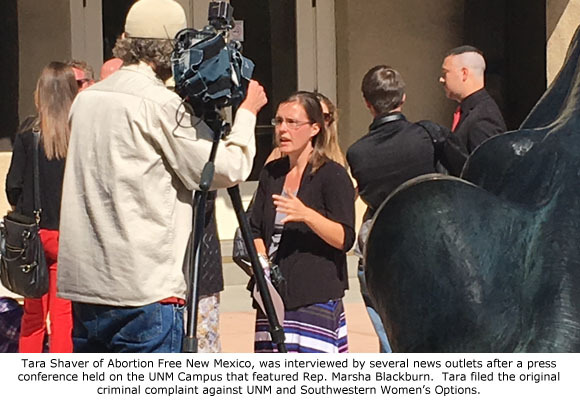 Albuquerque, NM – In a new, encouraging development, the office of New Mexico Attorney General Hector Balderas has confirmed to a group of pro-life leaders that an investigation of a complaint filed by Tara Shaver of Abortion Free New Mexico against the University of New Mexico (UNM) and Southwestern Women’s Options (SWO) is being “aggressively” pursued. This investigation also encompasses the criminal referrals against the publicly-funded UNM and SWO, the largest late-term abortion facility in the U.S., made by the House Select Investigative Panel on Infant Lives. Shaver’s complaint predates the Congressional criminal referrals. Both Shaver’s complaint and the criminal referrals allege that UNM and SWO violated the state anatomical gift act as it relates to the ban on use of aborted baby remains in research and failed to provide legally-required informed consent to women. “We are aggressively working on gathering further information that will assist in our ongoing review of this matter,” stated James Hallinan, Communications Director for the Office of Attorney General Hector Balderas, in a written statement requested by Operation Rescue. 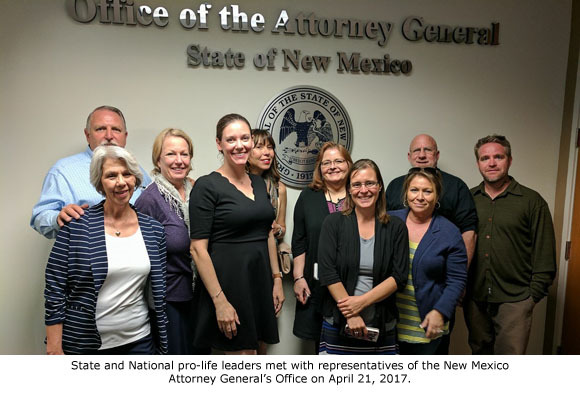 Representatives from national and state pro-life organizations met on Wednesday with Deputy Attorney General Tania Maestas, including Fr. Stephen Imbarrato of Priests for Life, Jeff White and Cheryl Conrad of the pro-life youth group the Survivors, Catherine Glenn Foster of Sound Legal Group, Cheryl Sullenger of Operation Rescue, and Bud and Tara Shaver of Abortion Free New Mexico. Maestas informed the group of leaders that the Attorney General’s office has sent “inquiry letters” to UNM and SWO requiring a “large amount of information to be produced” as part of the inquiry into alleged criminal conduct. 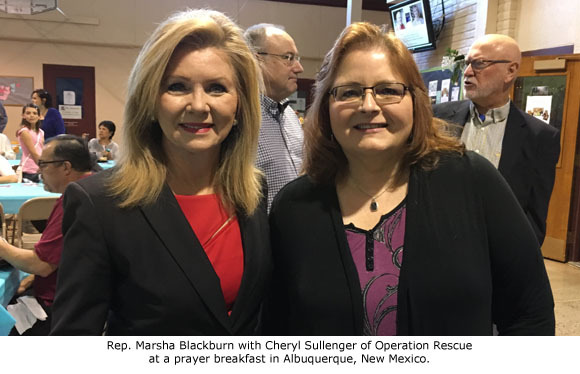 Earlier in the day, Rep. Marsha Blackburn, who led the House Select Investigative Panel on Infant Lives’ national investigation into the illegal sale of aborted baby remains for profit, addressed 150 pastors and pro-life leaders, telling them that UNM had never fully complied with subpoenas issued by the Select Panel. She said that at least four times, meetings were arranged with the Panel at the request of UNM officials, who never showed up for any of the meetings. Later, Rep. Blackburn headlined a press conference on UNM’s campus and called for a thorough investigation into the criminal allegations, urging UNM to come forward and comply with the law. Also speaking at the press conference were Catherine Glenn Foster, an attorney from Washington, D.C., who testified before the Select Panel during its investigation, and Fr. Stephen Imbarrato of Priests for Life, who called out both political parties for their inaction. Both Foster and Fr. Imbarrato were unfazed by loud heckling both received from a handful of counter-protesters. 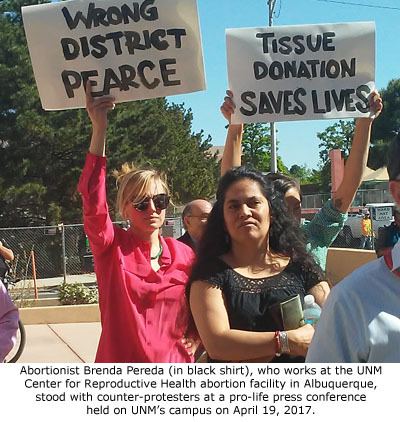 Among those counter-protesters was abortionist was abortionist Brenda Pereda, who conducts abortions at UNM’s off-campus abortion facility, the UNM Center for Reproductive Health. This week, Shaver and her husband, Bud, launched a new pro-life initiative called Abortion Free New Mexico. They plan to continue their work documenting abortion abuses at Southwestern Women’s Options, which is one of five abortion facilities in the nation that openly conduct abortions throughout all nine months of pregnancy, with the immediate goal of holding it accountable for crimes it may have committed and seeing the abortion business closed.